Bhubaneswar:14/8/18: A short film Chalo Jeete Hain throwing glimpses to the childhood of prime minister of India Narendra Modi was screened today at SoA University, Campus 2. 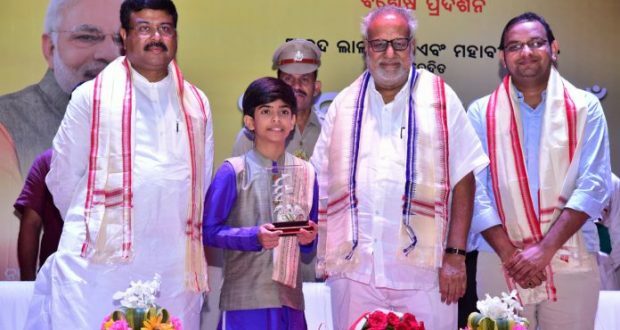 Governor of Odisha Ganeshi Lal attended as the chief guest of the occasion while Union Minister for Petroleum Dharmendra Pradhan graced the occasion as the guest of honour. In his insight into this premier show Lal narrated that prime minister of India Narendra Modi is a living emblem for the society who is giving much more respect to mother India. Union minister Pradhan said such type of movie will give mentorship to the youths that how a question clinched as Hum Kiske Liye Jete Hain coming in the minds of a 12 year child changed the scenario of the society. “I am feeling very proud to be a main carrier of LPG connections to poor households which was assigned by the PM,” Pradhan said.